The Conrad combines two separate self-contained cottages sleeping 6 and 4 respectively adjoined through two living rooms. Perfect spot for multigenerational families, 2 families or group getaways. The Conrad is a two story cottage great for large groups as there are two kitchens and three dining areas. One fully equipped kitchen is big enough for all the people that always want to help in the kitchen. The propane BBQ will give one a chance to get out of the kitchen. There is one dining area, one adjacent to the main kitchen that seats six and one dining area adjacent to the smaller kitchen seats four. When everyone wants to eat together, the deck overlooking the water is perfect as it accommodates 6 to 16 people for dining or lounging. The large deck facing west is the perfect place to watch the sunset or sailing regatta. The deck can be accessed from each of three living spaces. One complete with a fireplace for the cooler days, another more secluded living area is quiet and comfortable with overstuffed furniture and finally the solarium, which is sun filled and actually cantilevered over the water. These different living areas give everyone a place to be together or enjoy a little more privacy. There is a television in two of the living spaces complete with cable TV, Apple TV and free WIFi, for days when you don't want to be outside. Three of the five bedrooms have direct views to the water. There are three bedrooms on the second floor, two with queen size beds and one room so large the king size bed seems small. The washroom on this floor is a 4 piece. There are two bedrooms on the main floor tucked far into the quietest corner of this house. One room has a queen size bed and the other room has two single beds. There is a 3 piece washroom on this level. All linens, bath towels, blankets and pillows are provided. Please bring outdoor/beach towels. Of course this house comes complete with two (2) free beach passes to Sandbanks but you may want to bring your boat or just sit on the dock and spend the day on Picton Bay. Boats can be launched at Picton Harbour. See Notes re: boating instructions and confirm with Owner. I recently spent the evening in the Conrad 3 bedroom cottage with my partner and two friends from the US. The king size matter suite is wonderful. The dock and the sound of the lapping bay were great. I will return. Our friends had a great time on the Bay! Very peaceful and relaxing property. The house is clean and spacious. The owner John is so patient, kind and attentive. I would definitely recommend this property! We had a lovely stay at Shorehill cottages - we were in the Conrad and the connecting smaller cottage. We were a family of 8 with multiple generations meeting up with another branch of the family. The cottage was well appointed and just like in the pictures, comfortable for all of us. With the two cottages we had the advantage of two kitchens which was super and very helpful when we hosted our full family group of 17 for dinner - we had two ovens and fridges at our disposal. We enjoyed the view to the water and the proximity to Picton. John was a very responsive host, always helpful and appreciated. We'd stay again and have no hesitation recommending a stay at Shorehill cottages. Best cottage rental ever! Truly a fantastic place beautifuly decorated, clean, well stocked large cottage with the best beds and linens around. There were 8 of us very impressed with everything Shorehill provided. We never expected to find coffee, tea, and toiletries for us to use. It's like staying at a high end hotel. We loved it and so will you! We had a lovely two night family get-together at the Shorehill to celebrate a 50th and 87th birthday. We stayed in the Conrad and the Melville. The cottages were very comfortable and had all the conveniences of home. Property is well kept and beautifully decorated. Owners really cared about our stay, making sure we were comfortable. Location is great, quiet settings but only minutes away from town for convenience. Great for a family gathering with 2-3 families. Our kids fished at the dock which they loved and kept them entertained. Views overlooking the lakee were breath-taking both in the morning and evening. 20 minutes from Sandbanks. Owner included the pass to beach which was very thoughtful. For sure, we'll be back again soon! Our stay at Conrad Cottage was phenomenal. Photo's do not do the space justice! Everything is stunning! The cottage is also much more spacious than we expected. 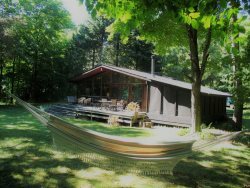 Conrad Cottage is also conveniently located only a short drive to Picton which was very helpful. We will be back to stay again! Thank you! We stayed at the Conrad for three nights with our two children aged 7 and 5. Had an absolute blast, fished on the dock every day and watched the beautiful sunset from the patio every evening. Beautiful rooms, views and John was a great host. Will definitely be back to Shorehill PEC!! It was a great family vacation! The house was just as pictured and beyond. Beautifully decorated - cosy and all the amenities of home! Very well situated - 5 minutes from town - 20 minutes to the beaches - which were gorgeous! We swam in the lake off the dock - bbq'd dinner and ate outdoors on the lovely deck watching amazing sunsets every evening. Our first time to PEC but definitely not our last! We had the opportunity to spend a week at this beautifully decorated cottage. I say cottage loosely because it really was a home away from home. John was an excellent host. Always available and went out of his way to make sure we had everything we needed. The home was so clean and comfortable from the open, well equipped kitchen, to the comfy beds, spacious bathrooms, incredible deck and outstanding lake views. Quiet neighbourhood, so peaceful and relaxing. We highly recommend renting this property...you won't be disappointed. Thanks so much John! Celebrated my bachelorette at the Shorehill cottages and could not have been more pleased with our rental. The house is gorgeously decorated and has great views on the water. We had everything we needed for a great girls getaway and John was a fantastic host. The house was great! Very clean, and comfortable. The view did not disappoint! Perfect for couples or families, and close to everything. Would definitely come back! Thanks John! My family and I had a wonderful time. We stayed in Conrad Cottage which is perfect for two or three families. It's totally soundproof and my young kids couldn't hear anything in the other cottage while they were sleeping! The cottage itself is beautifully decorated and very cozy.